Finally, a seasoned political leader is moving to the top tier of GOP primary contenders. But it’s not who the establishment was hoping for. As the months of Donald Trump’s GOP primary dominance turn into seasons, with the inscrutable outsider Ben Carson as his only serious challenger, anxious party leaders continue to hope that one serious candidate might emerge from the gaggle of senators and governors running for president to challenge the cartoonish anti-immigrant plutocrat. Finally, it looks like one seasoned political leader is beginning to rise from the back of the pack to challenge Trump. But it’s not who the establishment would have picked: Senator Ted Cruz is now rising in state and national polls, and has moved Carson out of second place in the all-important state (to those two men) of Iowa, where conservative evangelicals make up 57 percent of the Republican voter base. Cruz sits at 21 percent in the latest CBS News/New York Times Iowa poll, the first candidate besides Trump or Carson to top 20 percent in a leading state or national poll since the campaign began in earnest. And he leads the field on the question of who’s ready to be commander in chief, the poll says. The angst of establishment Republicans about Trump is understandable. This weekend alone, Trump tweeted inaccurate and racist statistics on black crime taken from a neo-Nazi Twitter account. He defended the beating of a Black Lives Matter protester at a Birmingham rally by insisting the man “needed to be roughed up.” He’s continued to entertain the notion of a database for Muslims in the United States, as well as the possibility of closing at least some mosques to deal with the threat of ISIS. And he repeated the long-debunked claim that “thousands” of Muslims in New Jersey cheered the terror attacks on 9/11. Even if party leaders are appalled by the latest escalation in Trump’s hateful rhetoric, there’s no reason to assume it will hurt him with voters. He’s held steady in every poll since the Paris attacks November 13. There is clearly a market within the Republican base—a rather large market—for Trump’s brand of hate. But as the AP noted, at the time of the interview Cruz was campaigning in Iowa alongside staunchly anti-immigrant right-winger Representative Steve King (R-IA), who has called Mexican migrants “disease-ridden” and suggested many are drug mules with “calves the size of cantaloupes” sculpted by carrying their heavy wares across the border. Was Cruz talking about King? How could that be, when he assiduously courted his endorsement? Mainly Cruz is trying to telegraph to conservative party leaders and voters that he understands if they’re squeamish about Trump and Carson’s inflammatory rhetoric and electoral inexperience. Of course Cruz would pursue many of the same policies as Trump if (sometimes) with milder rhetoric. In the wake of the Paris attacks, he has proposed only letting Christian refugees in from Syria—imposing a religious test that Jeb Bush has attacked (after seeming to flirt with it) but that might play well with Christian conservatives, who are convinced they’re the victims of a worldwide war on Christianity abetted if not led by the Muslim appeaser in the White House, whom he’s called an “apologist” for radical Islam. Still, Cruz’s rhetorical shift on immigration at least is interesting—and might even be politically risky in the climate fomented by Trump. “I am the son of an immigrant who came from Cuba with nothing, came here legally,” Cruz told the AP. “And my view, which I think the vast majority of Americans share, is very simple: Legal good. Illegal bad.” In fact, many conservative Republicans are wary of all immigration, worrying that the country is becoming a browner, less cohesive nation where newcomers no longer assimilate. Some Republican leaders have attacked legal immigrants for reflexively voting Democratic once they become citizens (given the GOP’s rhetoric, it’s easy to understand why). Will Trump seize on Cruz’s mild criticism to attack the Texas senator, as he’s savaged any other Republican who’s turned on him rhetorically? He hasn’t since Friday’s mild rebuke, but then he’s been busy defending his supporters’ violence against the Black Lives Matter activist and blaming reporters for tricking him into saying he supports some kind of database on Muslims. Even if Cruz’s new rhetorical moderation on immigration doesn’t hurt him, with Trump or with voters, it’s not clear that he’s a whole lot more electable, next November, than Donald Trump. He lacks Trump’s name recognition, his showmanship, and, for lack of a better word, his charm. He’s a polarizing far-right figure disliked by his Republican Senate colleagues. And he trails Hillary Clinton in most national 2016 polls—which, let’s stipulate, are close to meaningless a year out—only a little bit less than Trump does. 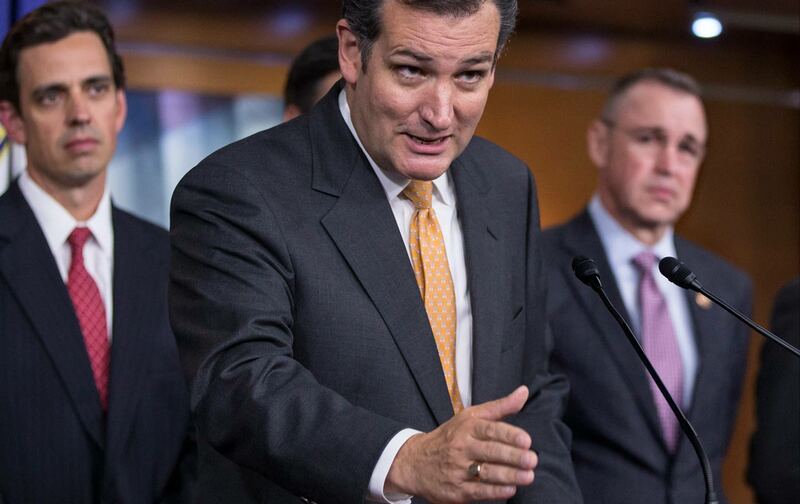 But right now Cruz looks like the only elected official poised to take advantage of Carson’s obvious stumbles and, potentially, Trump’s ever-escalating hateful rhetoric. Senator Marco Rubio (R-FL) rose into second place in the latest CBS New Hampshire poll, but he still trails Trump by almost 20 points, with 13 percent of the vote, just a few points ahead of Carson and Cruz at 10. In most polls Jeb Bush has flat-lined at about 5 percent of the vote, an embarrassing outcome for the man who’s raised the most money to date. But Cruz is second to Bush in fundraising, and his campaign currently has more cash on hand than Bush does. The Republican race is getting more interesting, but not in any way party leaders might have hoped.